I can sum up my time living in the Spokane/Coeur d'alene area to being like the stages in any long-term relationship that goes bad. There was the initial courtship and falling head over heels in love. There were ups and downs, followed by the relationship going stale. There was that horrible, lonely moment when I realized it was over. There was heartache, anger and a painful break-up. Then there was a final moment comparable to that part of a split where the worst times are over and you're tired and out of hateful things to say, and you just want to move forward and heal. And then, there's this…. where I finally come back for a visit after a year and a half, and shocked at how I'm able to let go of everything I don't like and just embrace the beauty and all there is to love. I guess this would be what I'd consider closure, and what beautiful closure it has been. Though I've been so excited to visit "home" that I listened to my road trip playlist on Spotify all last week, I was dreading the drive. The drive from Seattle to Spokane is monotonous and dull. But on Saturday morning, I looked at every wheat field, hill and acre of crops with a new appreciation. It's not familiar to me anymore. And it made me realize there really is no ugly part of Washington State. That's how the rest of the trip went. I spent time with the people who made my time there worth it. I enjoyed every moment. I caught up on their lives and learned juicy gossip, crazy stories and heartbreaking things. 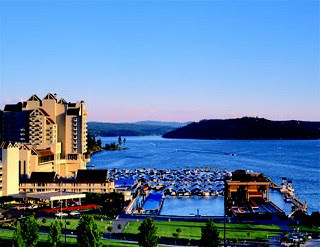 I got to hang out by Lake Coeur d'alene, which I still think is one of the most beautiful places on Earth. I drank too much peach vodka and sang karaoke and laughed until my face hurt. And I've been flooded with the most wonderful memories. Everywhere I went, there was a memory. By the time I left that area, it had sucked the life out of me. But last weekend, it brought me back to life and recharged me. I needed to go back to see how far I've come, but also to realize that no matter how much I change, my past made me who I am and who I will be. And those friends and I are able to reminisce about a lot of growing pains we went through together. They're memories I'll never have with anyone else. I'm able to appreciate that on a whole new level now. The one thing I was not able to do was drive past the old house. I gave it some thought, and decided I just can't. I can't drive by the place where we slept, ate, loved, entertained, laughed, cried, fought, experimented with who we were, and lived and see someone else's things in the window. I can't try and peer in at the walls we painted in colors we chose together and see that they replaced it. I love my life now and I wouldn't change it. But the fact is, had we stuck to our original "life plan" we'd still be living in that house with a child. I wouldn't know about half of my current social circle. That's weird. The decision to buy that place also caused a lot of drama and regret in our lives. And it's still too fresh, too painful, too whatever to re-live. But truly, my trip was perfect. The weather was scorching hot, which this girl from the desert needs now and then (no offense, Seattle). The food was delicious and the drinks did not stop flowing. So I guess this is the part of the relationship where we run into each other after a lot of time has passed, and we tell each other sincerely that we both look great, and we greet each other warmly and forgive each other for the hurt. And while we don't feel the love we once did, we are able to realize why we felt it in the first place. We're able to heal and really move forward. Maybe we exchange some flirty banter. Hell, maybe we even get drunk and dance a little too close on the dance floor. But at the end, I happily return to my new, true love, the healthy and passionate adult relationship I am meant to be in. And Idaho will keep doing its thing and making people who are not me happy, and that's great. Because instead of sitting around wishing things were different, I made the change and found a place that was different. And no amount of sunshine or flavored vodka can make me wish I hadn't.